At Home Mobile has a convenient, on-site x-ray machine and state of the art digital processing to provide rapid images to further aid in diagnosis of your pet's problem. 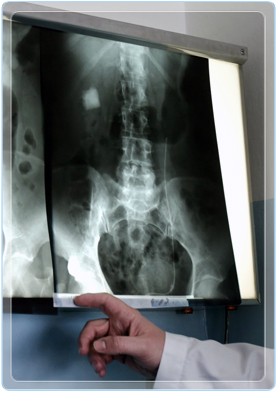 X-rays are useful in determining the size and location of bone fractures, pinpointing causes of pain and arthritis, detecting the signs of heart disease, and diagnosing problems within the abdomen. Soft tissue diseases in our pets are sometimes not visible with x-ray technology. We now offer abdominal ultrasound to help diagnose liver, kidney and bladder problems as well as helping confirm pregnancy in dogs and cats as early as 25 days gestation. Our mobile hospital can rapidly perform blood chemistry and CBC analysis, thyroid levels, canine heartworm, and feline leukemia/FIV tests. We also partner with two large full-service referral laboratories to send out any diagnostic tests needed for you pet.